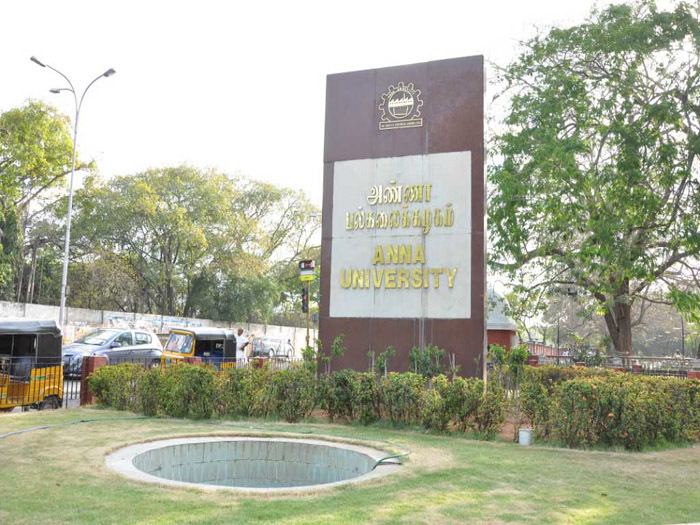 VIVEKANANDA AUDITORIUM, ANNA UNIVERSITY CAMPUS - CHENNAI. 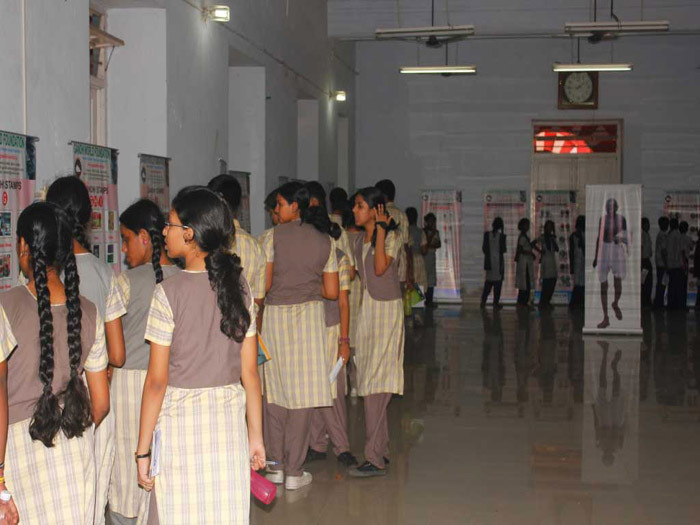 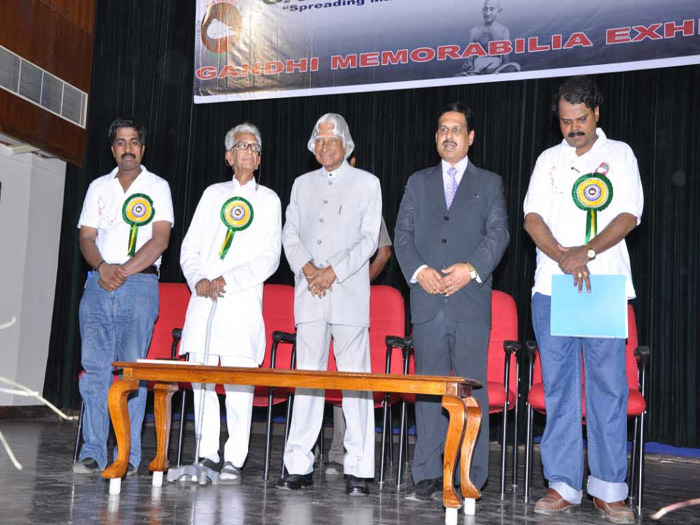 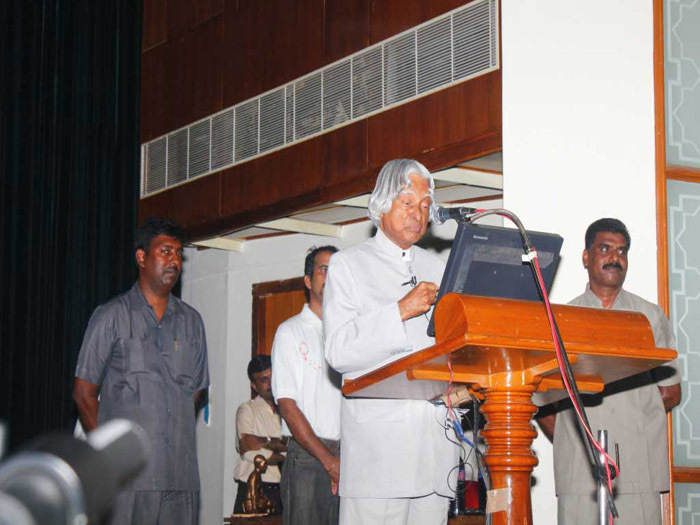 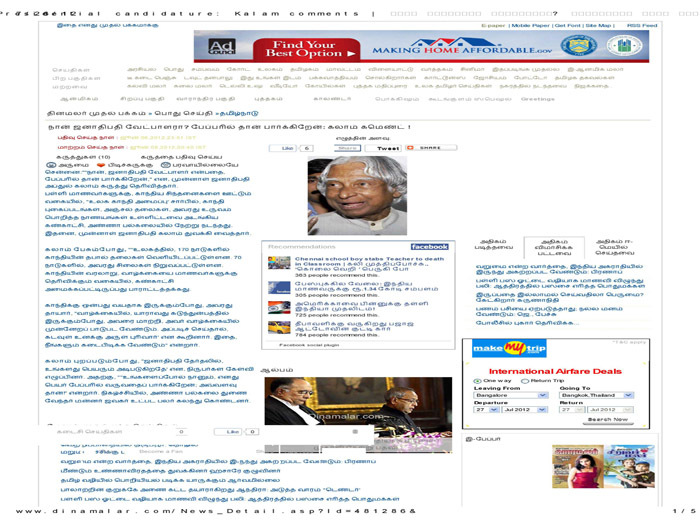 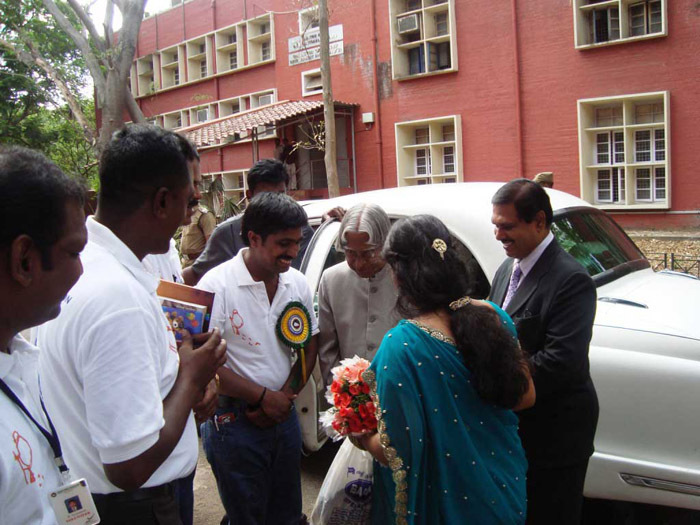 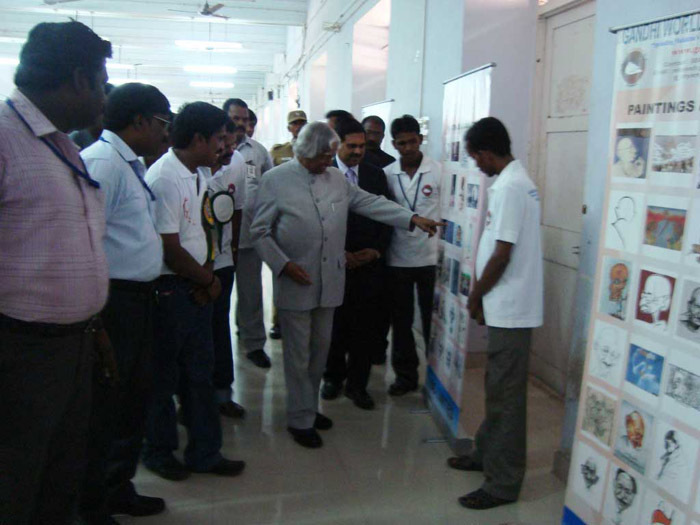 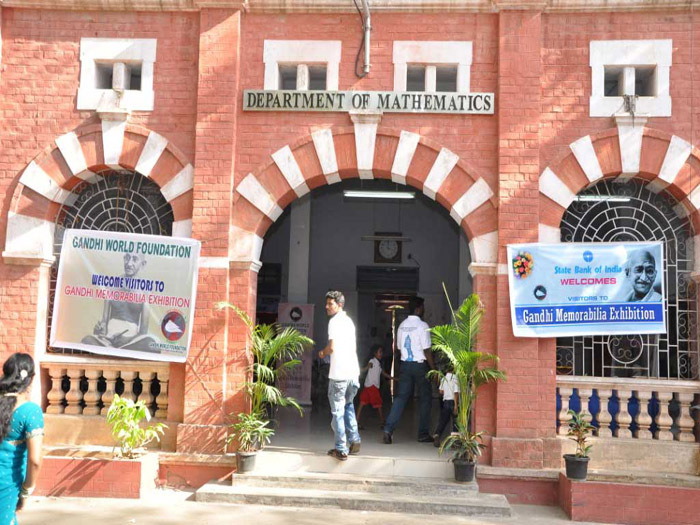 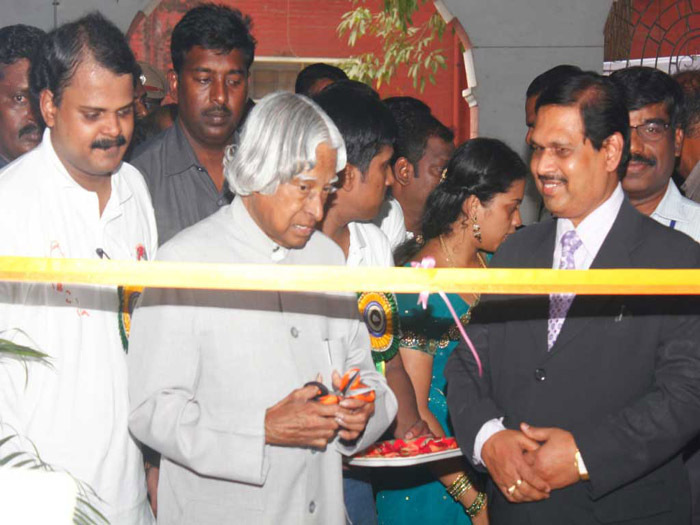 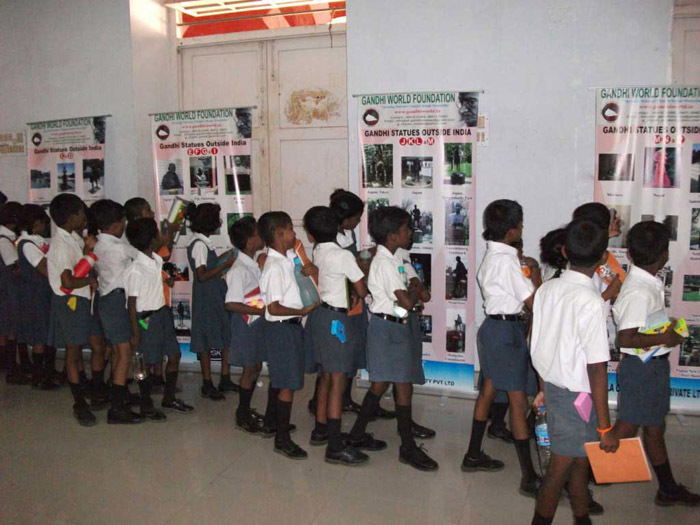 The exhibition was inaugurated on June 6th 2012 by Hon'ble Former President, Dr.A.P.J.AbdulKalam. 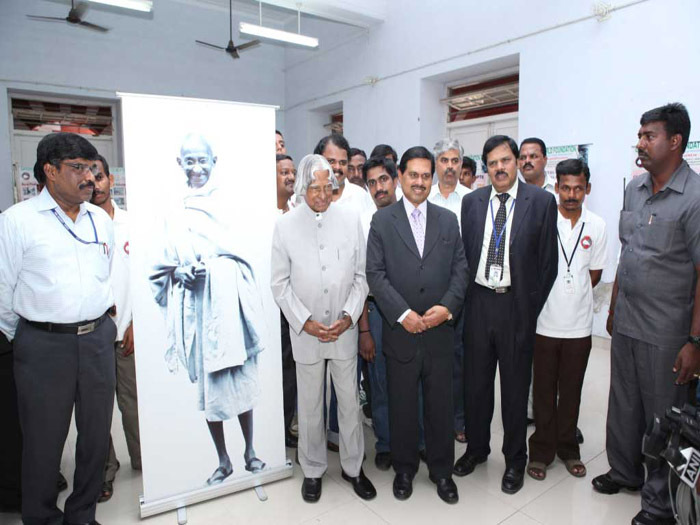 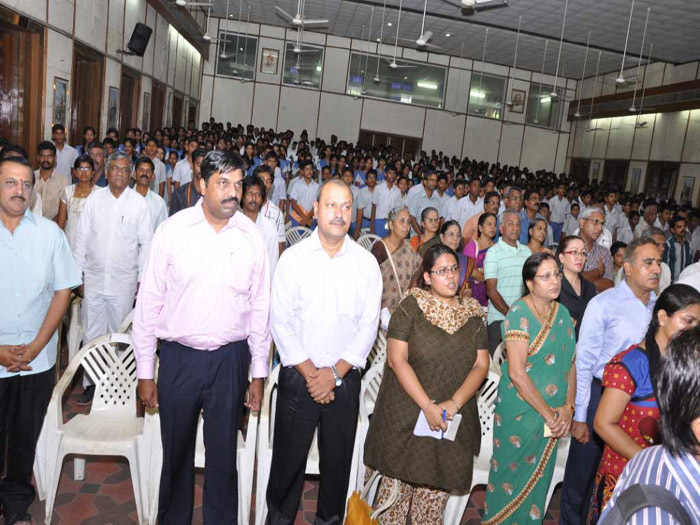 Dr.P.MannarJawahar, Vice Chancellor, Anna University also spoke during the time of exhibition inauguration. 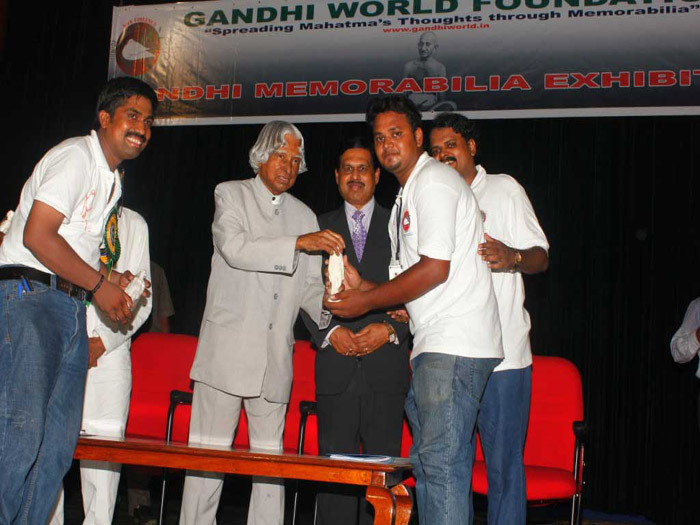 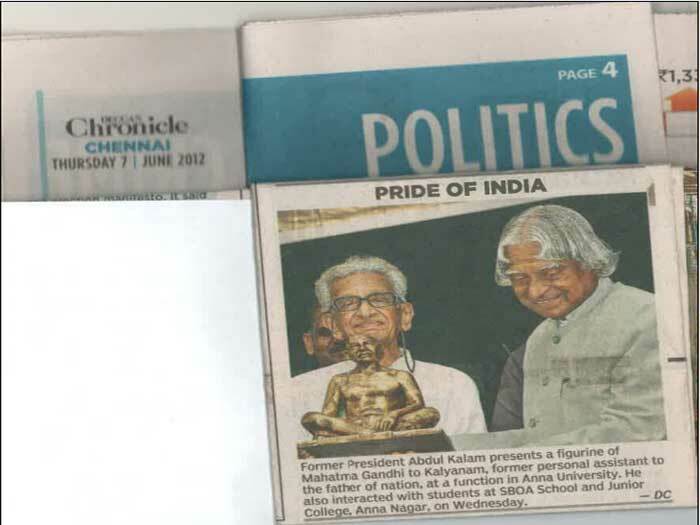 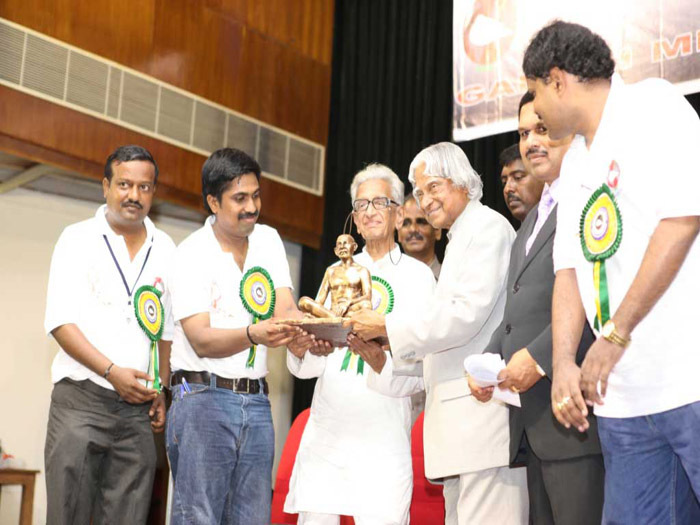 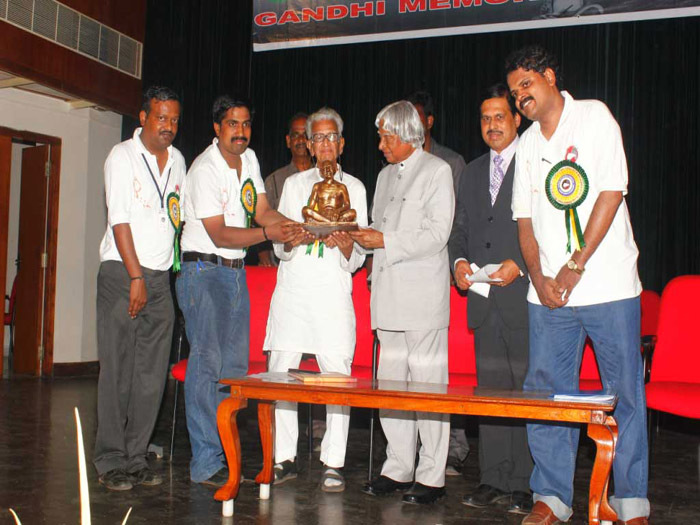 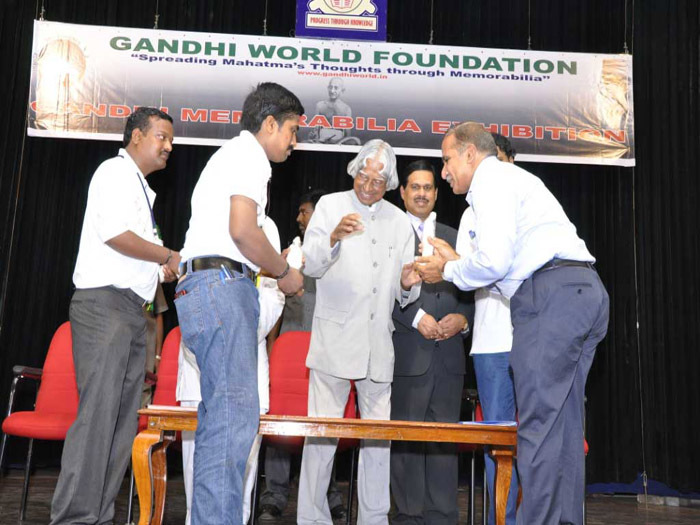 Shri.Kalyanam, Personal Secretary to Mahatma Gandhi (1944-1948) was felicitated by Dr.AbdulKalam during the exhibition inauguration. 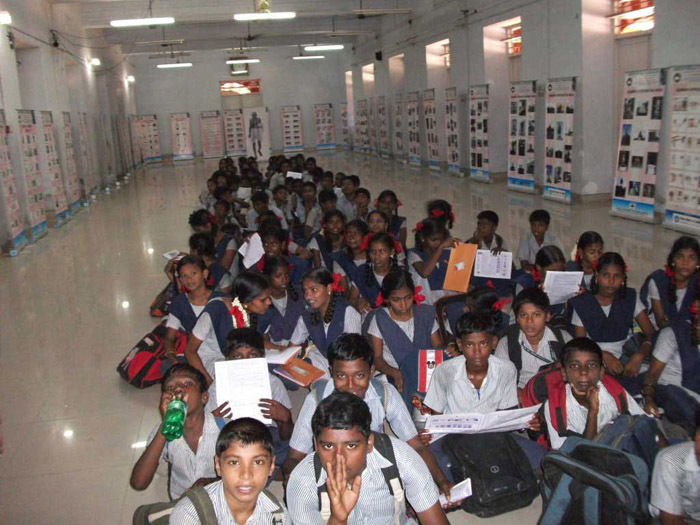 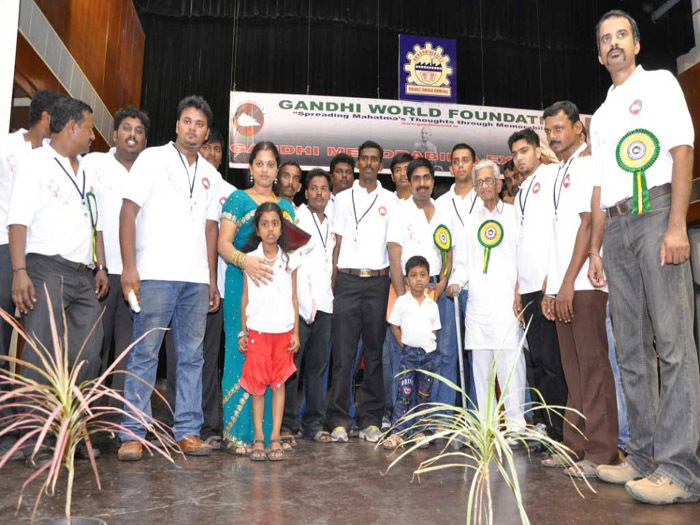 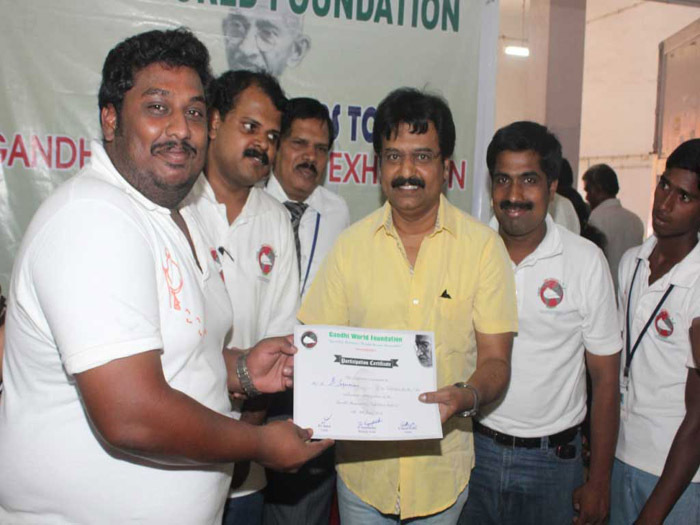 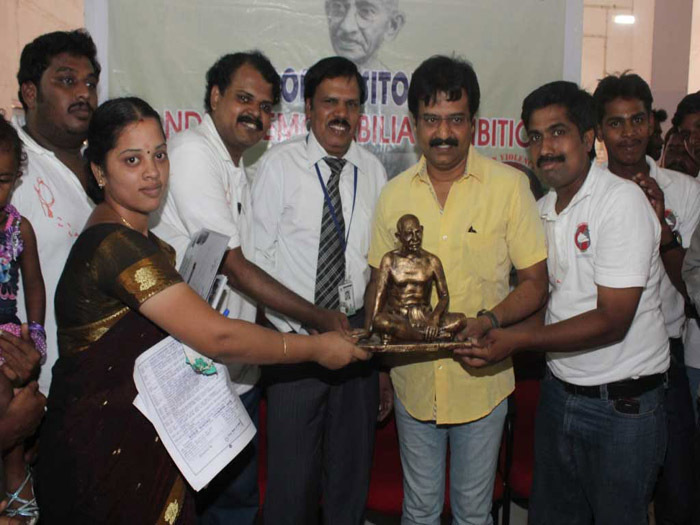 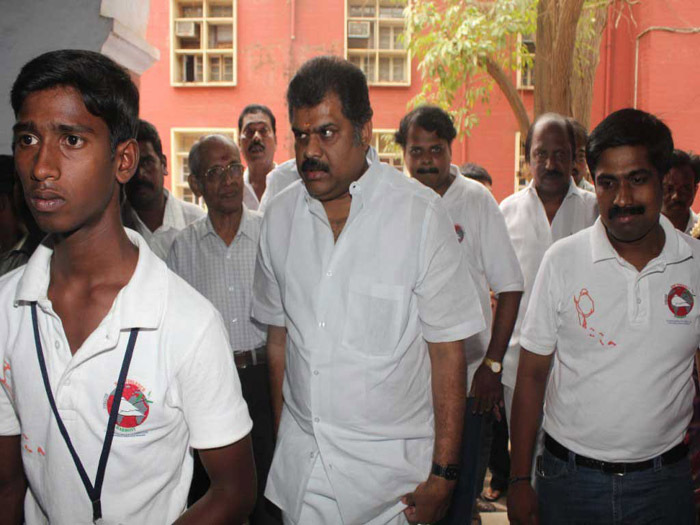 On June 10th, Cine Actor, Mr.Vivek visited the exhibition and gave participation certificates to the Volunteers. 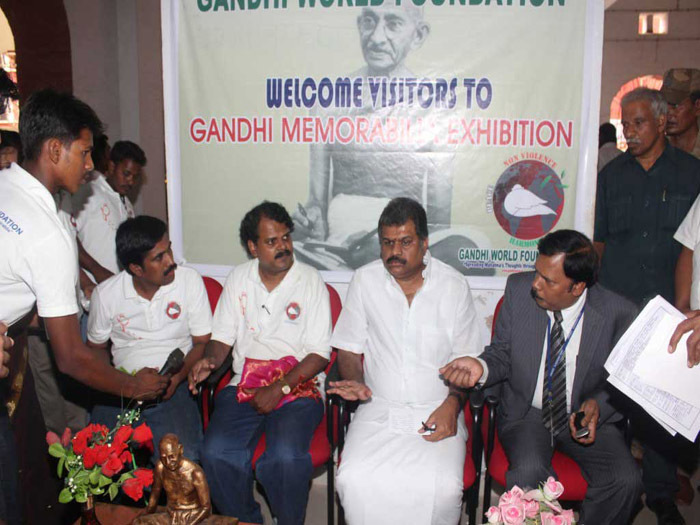 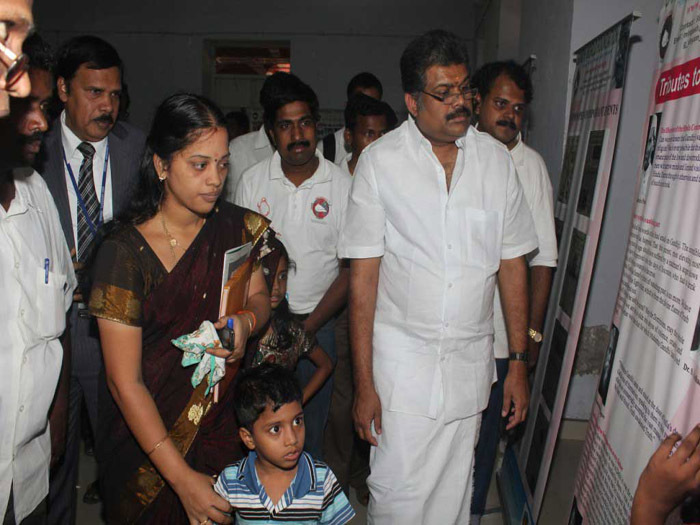 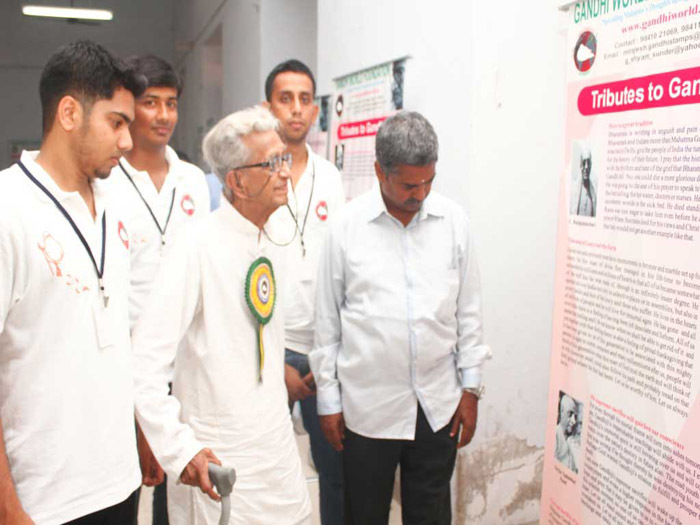 Union Minister Shri.G.K.Vasan also visited the exhibition on June 10th and spent close to 1 hour time and appreciated the efforts of Gandhi World Foundation for conducting a fabulous exhibition on Mahatma Gandhi. 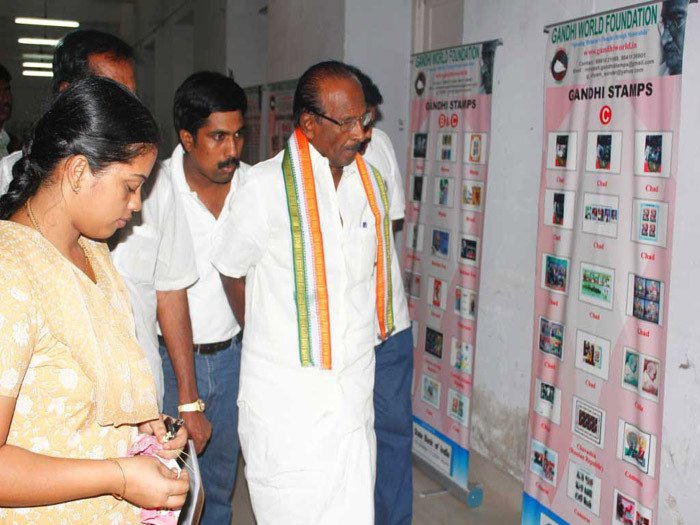 ML.Rajesh Founder Trustee, Vijayalakshmi Rajesh Managing Trustee and G.Shyam SunderTrustee, along with 25 Volunteers were present on all days during the exhibition. 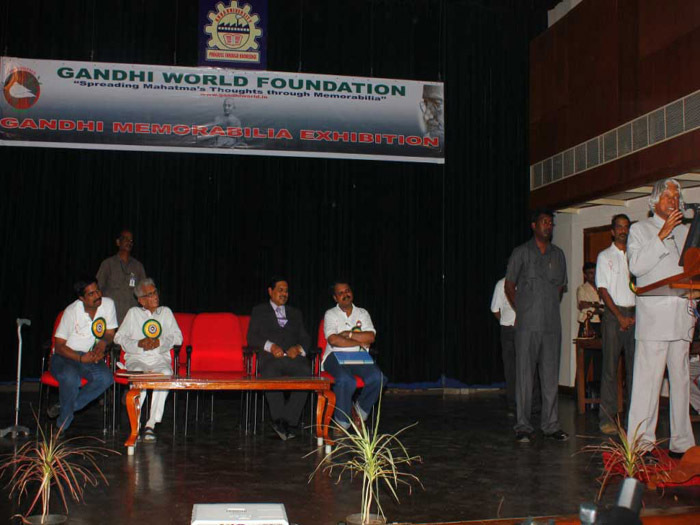 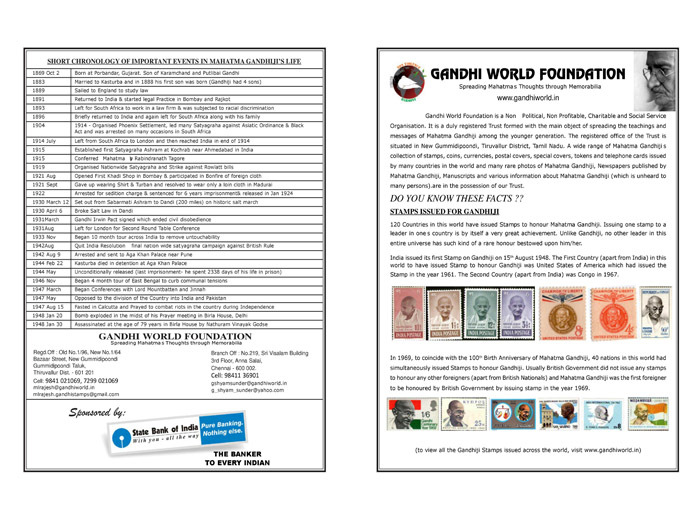 All the visitors to the exhibition were shown a 10 minute Gandhiji documentary DVD. 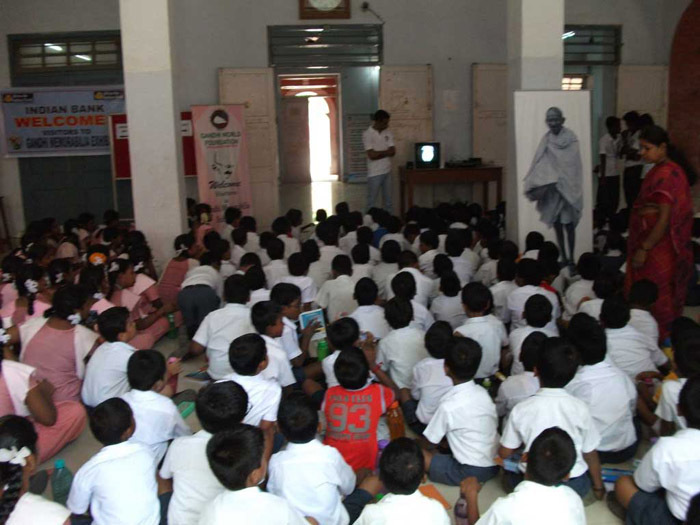 We would ensure that young children are made aware about the good teachings of the father of our nation and thereby inculcating good morals, values, manners, ethics, self-confidenceetc to them in their life. 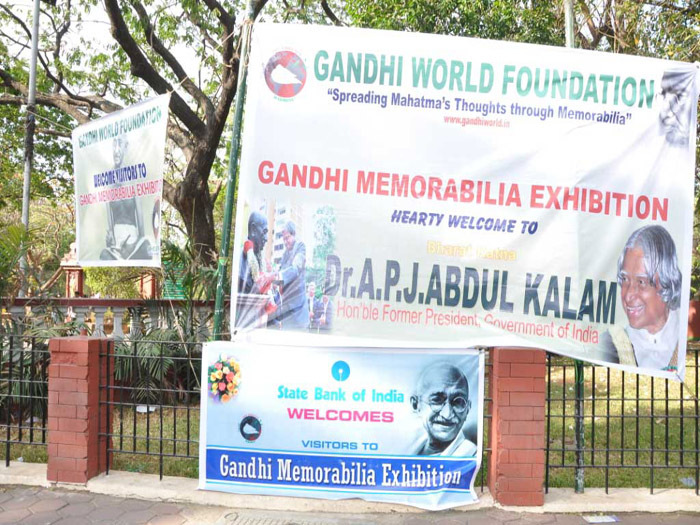 We wish to ensure that Mahatma Gandhiji is viewed as a role model by the future young generation of India and that we shall be very happy even if we are able to bring about a change in 5% of the young generation all across India. 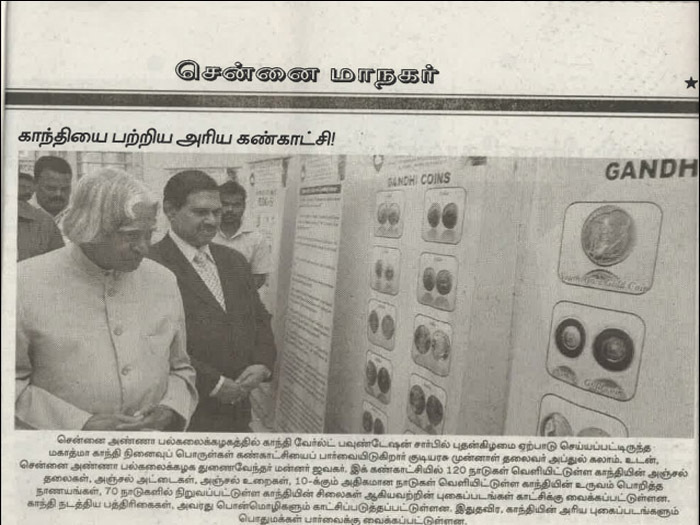 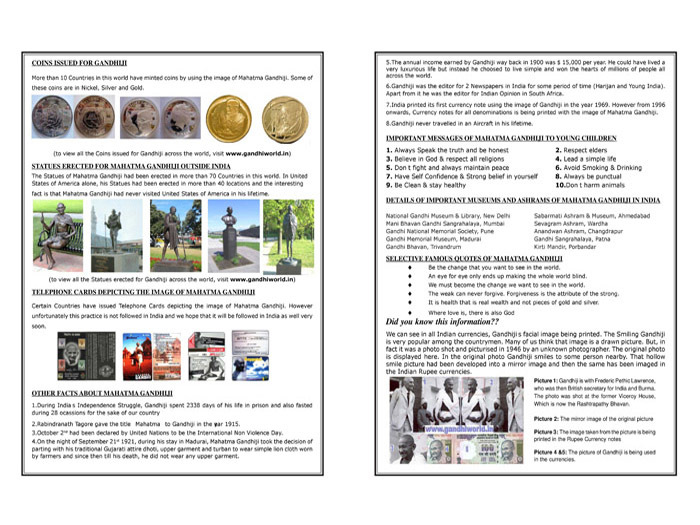 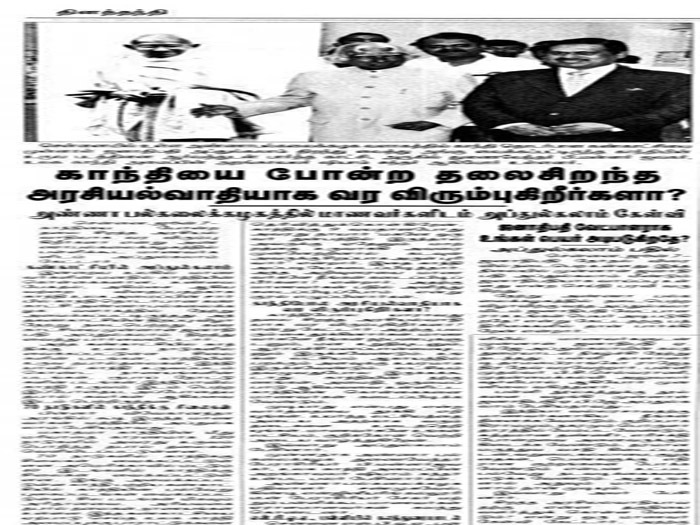 We intend to initially commence this exhibition in Chennai and then conduct it all over the State of Tamil Nadu and subsequently take it forward all over the country in a phased manner.